Whether you’re looking for Arborio rice to use in your risotto recipe or white rice to make tasty stir fry, we’ve got you covered. We also offer bulk jasmine rice that can be used in sweet Thai recipes like mango with coconut sticky rice and flying lotus. If you’re looking for a healthier rice alternative, we also have brown rice. With a variety of package sizes, finding rice in bulk for your establishment has never been easier. Also make sure to check out other great items from Regal Foods, Gulf Pacific, Producers Rice Mill, Royal Rice and Uncle Ben's. Complement the flavor of your meat and seafood dishes with our wide selection of wholesale rice. With so many bulk rice options, finding the right one for your restaurant is simple. Since most rice is naturally wheat free, it’s perfect for use on your gluten-free menu. For products to cook your rice with, check out our commercial rice cookers, rice cooker and warmer accessories, and steamer sets. 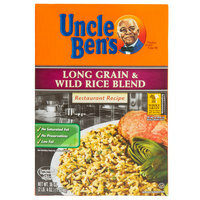 If you're wondering where to buy uncle ben&apos;s rice, we have a large selection of uncle ben&apos;s rice for sale at the lowest prices.